Richard Hirst. Bespoke Building & Maintenance: HWAM 2620 Wood burning stove installation. Cornwall. HWAM 2620 Wood burning stove installation. Cornwall. Removal of an old morso stove, slate hearth and mantle & Carpet. Repairs were carried out to the leaking chimney stack. The fireplace opening was taken back to bare stone, repaired, rendered and plastered as required. 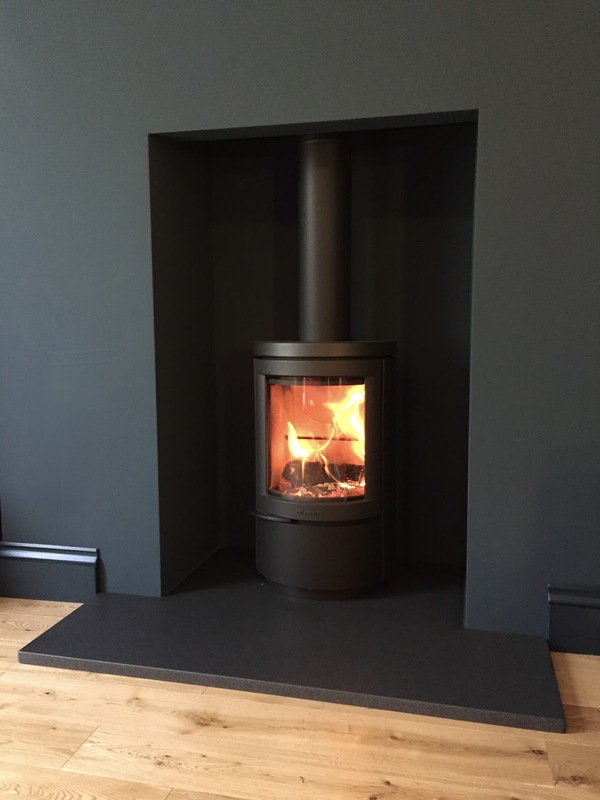 New engineered oak flooring, New skirting boards, honed black granite hearth by F. Wearne & son. Paint is Farrow & Ball Hague blue estate emulsion & eggshell. HWAM 2620 woodburning stove.